Frozen is the latest animated film from Disney Studios. 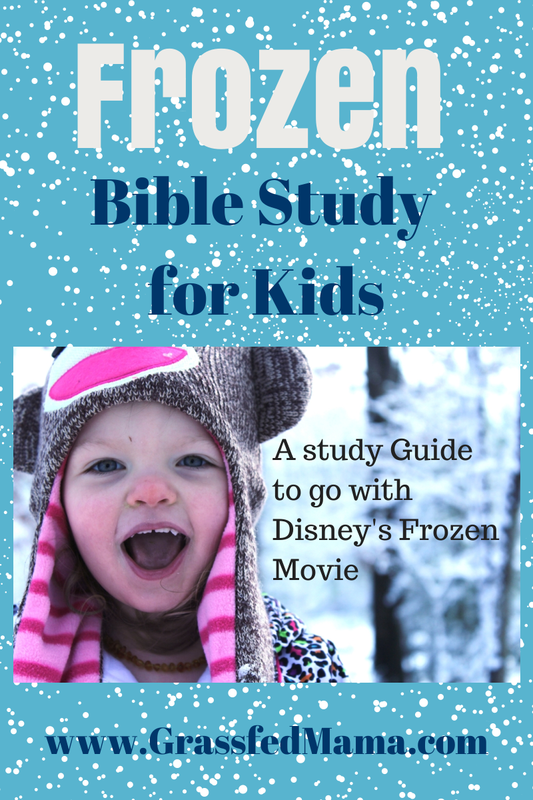 Here is a simple Bible Study to go along with our new favorite movie, Frozen. If you have watched the recent movie, you may see that there are a lot of teachable moments in the film to talk about fear and love and their powers in our lives. We have enjoyed watching this movie (over and over) with our daughters and learning about fear and love. I hope you can use this Bible study to help your kids understand more about true love and how it can overcome fear. These are some questions to talk with your kids while enjoying the movie Frozen. 1. What is stopping Elsa from living her life outside of the castle or being closer with her sister Anna? – Fear/Being Scared of hurting someone, especially someone she cares about. 2. How can fear stop us from enjoying life? – Ex. Being scared to try something new, not letting people get to know you. 3. Does fear come from God? – No, Love comes from God. There is no fear in God. Listen to to the song “Let it Go” from the movie. Don’t See it? Click Here! Elsa was scared of hurting other people with her powers and people finding out she was different. Once Elsa wasn’t afraid anymore, she was able to Let Go of the Fear and use her special abilities to create a castle and beautiful things. God has given all of us special gifts. When we are able to let go of our fears, we are able to use our gifts for him. Listen to the song Fixer Upper. Don’t See it? Click Here! 4. Are we perfect or are we all fixer uppers? 6. In the bible, how did Jesus show us true love? – He died for us, when he didn’t have to. Anna was dying from a frozen heart, can someone have a frozen heart in our life? 9. How was Elsa able to gain control of her powers and unfreeze Arendelle? – through the power of love. Love can thaw a frozen heart. Make an Olaf Snowman along with your Bible Study. Click Here for Directions. How have you used something in culture (a song, a movie, an event) to talk about a spiritual idea or lesson with your kids? Leave me a comment, I love to hear from you. This is great! I love that you’ve put Bible based lesson within a modern movie. That can be a difficult task these days. Great post! Thank you so much for checking it out! My husband and I really try to redeem things in culture and use them for teachable moments. This movie has so many great teachable lessons for all of us. You are welcome! It is a family favorite… probably my favorite Disney movie. I’m so glad you loved it! My husband and I really try to redeem things in culture. This was a pretty easy tool to use to teach a life lesson (and our daughter loved the movie so much, we knew that it would be something she would be interested in). I thought so many other families would enjoy being able to talk to their kids about love and fear in a fun way as well. This is great! I was catching a few drifts that I wasn’t feeling with this movie, but I love how you were able to make such a great guide for kids! This is perfect to use for a family night kind of bible study! 🙂 Great job! This is a great way to draw parallels between the movie and our life with Christ. I see lots of great connections, most specifically that Elsa could not save herself; neither can we. Anna sacrificed herself for her sister just like Jesus sacrificed Himself for us with Bible verses that talk about that sacrifice. I see other parallels not listed here, but it has jump-started my thinking on what to add and how to use the above. Great idea; thanks! Yes! So so many applications in the movie we can use to talk about Jesus. It is so amazing how Disney could make a movie that was so full of truth. Thanks for reading! Thank you for this wonderful Bible Study! My 4 year old and I are currently reading the Frozen junior novel and I can’t wait to do this study with her. I love that you use a popular movie that preschoolers are “into” to teach about Jesus’s love and the Bible. I’m so happy I found this post. Thank you so much for this! I keep seeing articles around the internet where Christians are bashing this movie and the songs saying that they teach our children bad things/traits, and I disagree! I think this movie is an innocent children’s story. I think when Christians find ways to complain and bash everything single secular thing it turns people away from Christ, because they feel they are deprived of all enjoyment and entertainment. I love that you did the opposite and found a way to use this movie to show Christ’s love. Thank you so much for this!! My husband and I will be doing this with our kids. This is amazing! My sister will love this too (if it wasn’t her who pinned it in the first place). 🙂 Great stuff! Love, love, love this!! The popularity of the Frozen movie is still strong, even here in New Zealand, and this is a great way to simply link what God says about what the characters are going through, and how our kids can apply it to their lives. I’m going to be sharing this wherever I can!! 🙂 Thank you!! Thank you so so much! I am so glad you enjoyed this bible study lesson. I love this, I’m always looking to find messages of faith to teach the kids in my family. They love frozen so I’m sure we’ll have to watch it over winter break this year. I’ll try to remember to use this! Thank you. I incorporated a lot of stuff from the movie in a spiritual way 🙂 If anyone wants ideas I would be more than happy to share! Wow. This is a fabulous idea. I’m not sure how to bring this down to my (almost) 3 year old’s level of understanding (because she is still learning about Jesus as it is), but the concept is winderful. (& I’ve also loved reading your replies to other comments. The idea of rejecting, redeeming or receiving is great!! Thank you, Rachel! I know that for really young kids, I would just focus on love. Who are the people who love us – and that God love us! We can talk about how God made us all special and he loves us. Hope you have a Happy New Years!! Wow, I absolutely love this! I was just cruising the internet looking for ways to incorporate movies into our bible study at church and I found this. Thank you! I LOVE how simple it is, and honestly I plan to use it for young adults from ages 18-24 hahah. Sometimes we need to take a seat and learn to look at things from another point of view! If you or anyone else have any other study guides like this I’d love to see them. We need to change things up a bit in our group and I find this to be rather refreshing. God blessed you with a gift of seeing things with what I call God goggles. He didn’t condemn when He came rather He redeemed and you finding good in all around us like kids movies is inspiring. I will be covering you with prayer so you might do more movies. I will also be sharing this with a special little girl who is having a frozen themed party soon. She has a heart for Jesus and will fall more in love with Him as she can relate scripture verses and lessons to her favorite movie. Everything God gives us has opportunities to praise Him and to build up His kingdom. Amen? Tank you for sharing this gift with us.